Master Vosloo was a great High Priest in Atlantis working in the Temple of Abundance and Prosperity with the Golden Flame. He worked with people to help them to manifest their highest potential with deep compassion and understanding, where ever they are at in their life path. He taught the other Priest’s and Priestesses to also work with the Angel’s to bring forth pure gold ray’s into peoples consciousness to give them peace of mind and to help them let go of fear based actions and to radiate their love into divine harmony. In Atlantis, Master Vosloo installed information into crystals so we may receive this information today. He has not been back to this world until now knowing of the great challenges our planet has ahead. He is here to help us to remember our dreams and inspirations of our lives here on earth. Master Vosloo is Cohan of the 9th Ray. Those who connect with Master Vosloo will receive the abundance of Joy that radiates from the Angel’s of Atlantis that serve from the higher source. Master Vosloo is asking for all those that work with him to expand their consciousness from their heart and mind to illuminate and radiate like the sun outwards filling the whole being with golden light and working with the Mahatma Energy from Atlantis, that has been bought back to us now. In your daily meditations ask for wealth, health and abundance through the Mahatma energy. Ask Master Vosloo to install the gold flame for harmony for the divine spirit within. 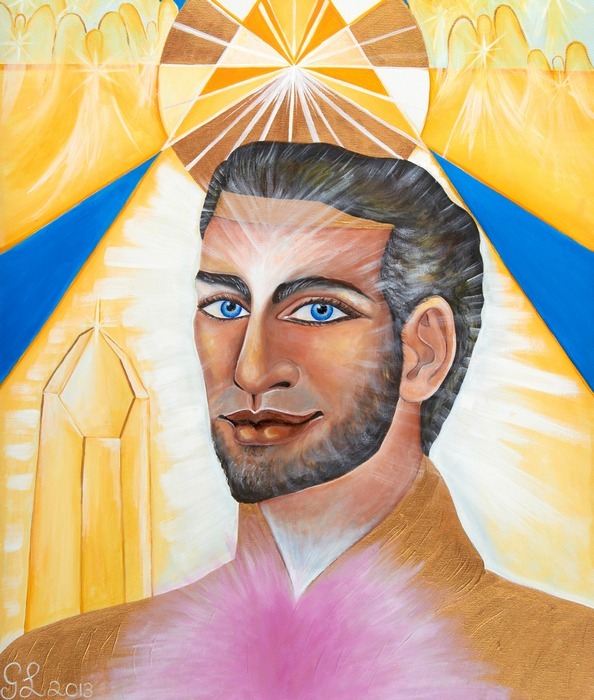 The painting of Master Vosloo shows a pyramid of energy coming down from an orb with the Atlantean Angels bringing beams of gold light down to the consciousness to receive the abundance and prosperity. Master Vosloo is radiating through his heart center, compassion and love for all.